The marriage of Sasikala and Britto was held in Phuket with all aplomb and panache. A multitude of guests, over 40 artists and three days of celebrations. Celebrities like Narain, Jojo, Martin Prakkat, Liberty Basheer, Renjith Pauland and others were also part of the celebration. Serendipitous Smiles, best destination wedding photographers were flown in from Ahmedabad to photograph their beautiful memories. 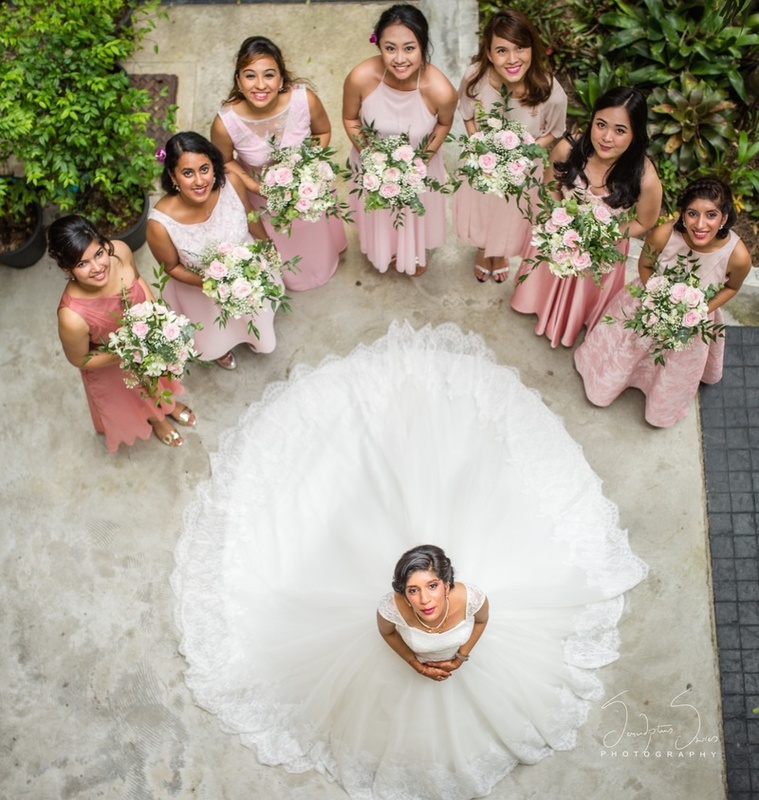 Radhika Pandit, from Serendipitous Smiles shares the beautiful pictures of the dream wedding for the Kochi-based couple Sasikala Kaladharan and Britto in Phuket. The massive wedding celebration which was handled by Rainmakers Event Company embraced all the aspects of both the Kerala culture and that of Thailand. It even had the flavour of Naushad’s famous biryani and traditional Kerala sadhya served, for which they took the chefs to Phuket. The Daawat-e-Mehendi saw the Serng Kratip Khoa performers – North Eastern Thai long drum musicians and dancers. Themes and dress codes for all events were designed. A North Indian and Thai fused Mehendi ceremony named Daawat-E- Mehendi, a South Indian themed Sangeet, Why This Kolaveri Nite, a conventional Hindu Kerala wedding and a traditional Thai wedding called Thai Vows followed by Cherry Blossom themed western reception called Sakura Ball completed the grand event. On the 'Why This Kolaveri Di' Night, Sasikala chose to wear a red light lehenga with a gold border and a high-neck top. Britto dressed himself in a black shirt and a colourful Sri Lankan lungi. The guests, according to the dress code, were in specially imported Sri Lankan lungis, sunshades and half saris. The band Thaikkudam Bridge and a specially orchestrated ensemble by Stephan Devassy were the highlights. The shoot mainly consisted of long shots and silhouette photos amongst heritage Thai locations. The Hindu wedding saw in a gorgeous midnight-blue Indian empire-line gown with heavy gold details. Her jewellery was minimal. The groom looked dashing in a smart eggplant-coloured Sherwani. The extravagant décor is what stole the show. Colourful drapes, matching seating arrangements, suspended paper lanterns and a vibrant mandap décor were a few key elements. This Thai ceremony had the entire congregation dressed in western formals. Britto looked handsome in a classic 3-piece black suit while Sasikala looked stunning in a pristine white wedding gown with a single-strand necklace. The theme of Cherry Blossoms looked simply beautiful amidst the serene backdrop of the beach. Thai vows and ceremonies were undertaken to commemorate their wedding. The theme of the wedding continued onto the reception. Fairy lights decorated the ceiling that was covered in soft pink and white drapes. Lanterns adorned with flowers and leaves were suspended from them. The table settings themselves were rather stunning. Each table had a gorgeous centrepiece of floral arrangements and warm candle lighting.